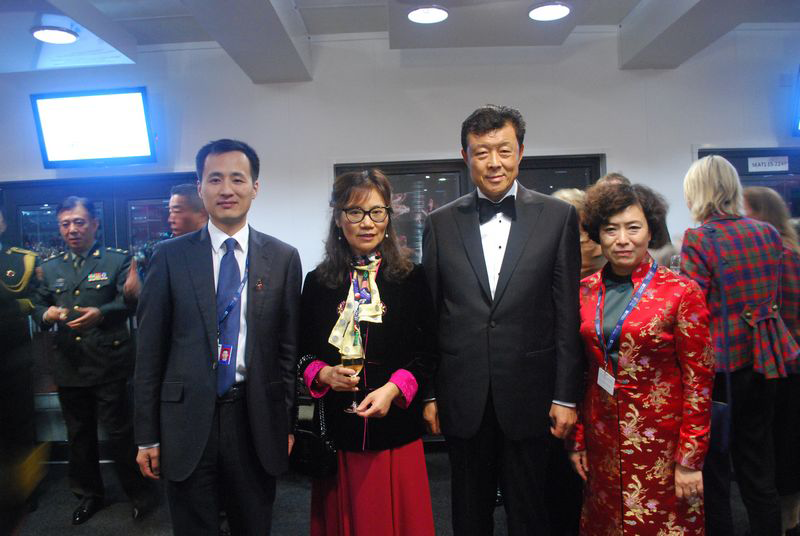 On August 20th, 2015, Ambassador Liu Xiaoming and Madam Hu Pinghua attended the 66th Royal Edinburgh Military Tattoo and Edinburgh International Festival. 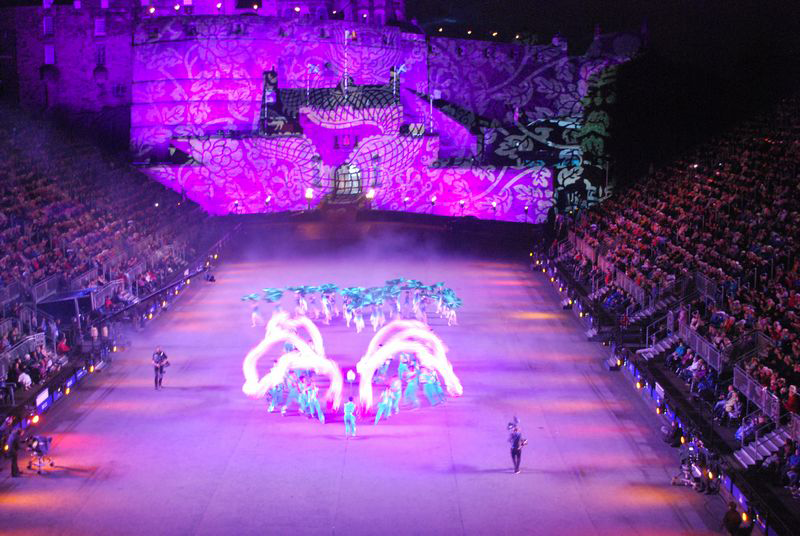 August 19th was "China Night" of the Royal Edinburgh Military Tattoo. 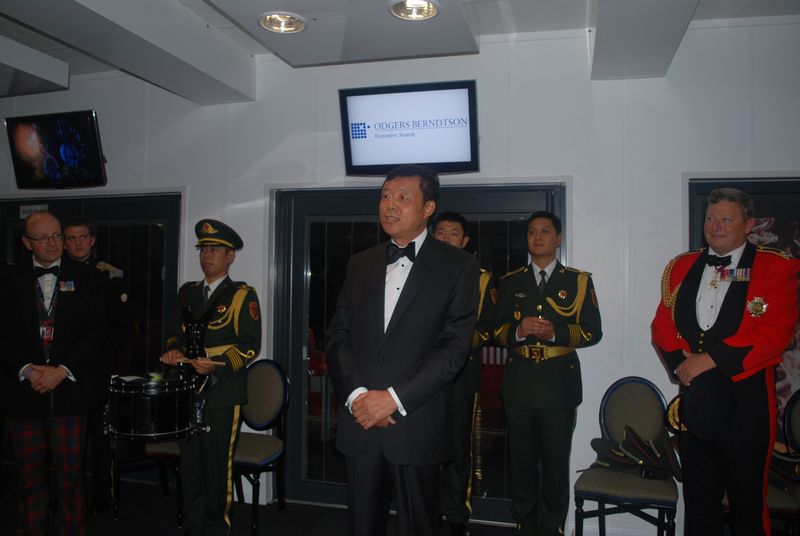 Ambassador Liu Xiaoming was an honorary guest of the "China Night" and gave a speech at the VIP reception. He noted that 2015 is the China-UK Year of Cultural Exchange and talked about a series of events to be held in the UK. The performances of the Military Band of the Chinese People's Liberation Army and Zhejiang Changxing Lotus Dragon Art Group are important events of the China Season of the Year of Cultural Exchange which started in July. In October, President Xi Jinping will pay a state visit to the UK at the invitation of Her Majesty The Queen. This visit will become a new milestone in China-UK relations and usher in a "Golden Time" in China-UK relationship. At such an important moment, the events of the China Season in the UK will push China-UK cultural exchanges and cooperation to new heights and inject new impetus into China-UK bilateral relations. 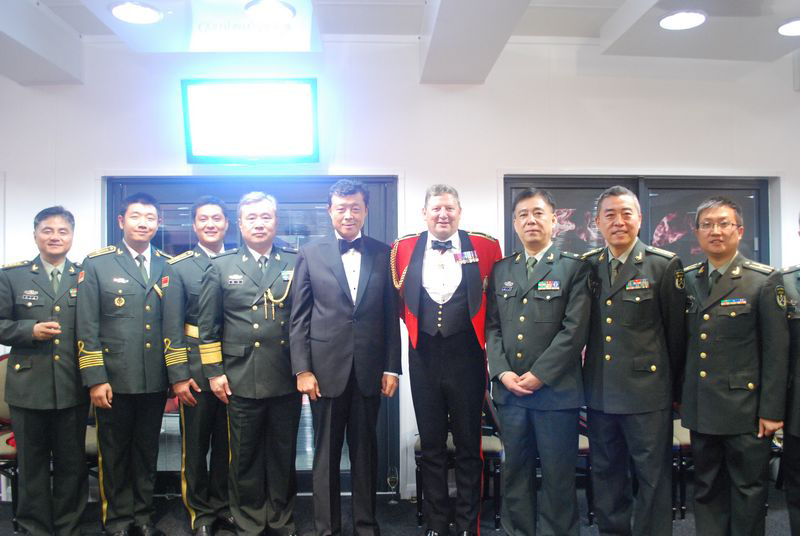 After announcing the opening of the show on "China Night", the MC introduced guests of honour Ambassador Liu and Lieutenant General Sir Chris Deverell to an audience of over 8,800. They were invited to take part in the traditional ceremony on the esplanade, drinking whisky and kissing the bottom of the cups to give their blessings for the success of the Tattoo. The performance began with the Military Band of the Chinese People's Liberation Army marching valiantly into the esplanade, playing Ode to the Motherland. The spectators responded with warm applause. The Band went on to give three performances in 8 minutes and 30 seconds: the Journey showcased the charm and bearing of a great nation; Burns Night and Half Moon, an adaptation from the Scottish masterpiece and the Chinese folk song, was perfectly pleasing to the ears; and Soldiers' Glory demonstrated the pride of Chinese soldiers. Against the sunset glow, dragon dancers of Zhejiang Changxing Art Group transformed lotus flowers into four rolling and majestic dragons in a most lively, colourful and magical display of the oriental culture. About 150 artists appeared in the performances of the Military Band of the Chinese People's Liberation Army and Zhejiang Changxing Lotus Dragon Art Group. Their performances became a major highlight of this year's Royal Edinburgh Military Tattoo and were warmly welcomed by the audience. At the end of the performance of the Military Band of the Chinese People's Liberation Army, Ambassador Liu rose in the spotlight to take the salute from the band and waved to the band and the audience. At the end of the night's show, the atmosphere came to a climax as the audience rose for the national anthems of China and the UK played by the military bands. While in Edinburgh, Ambassador Liu and his wife also watched the performance of the Modern Dance Troupe of Tao Dance Theatre and talked to the artists. They also met with pianist Lang Lang, who gave a solo concert during the Festival. Both are highlights of the 2015 Edinburgh International Festival and both are important events of the "China Season" of the China-UK Year of Cultural Exchange. Ambassador Liu expressed thanks to the artists for their contribution to China-UK cultural exchanges and encouraged them to continue the excellent work. Royal Edinburgh Military Tattoo was first held in 1950. Every summer, military bands and art troupes perform in front of the Edinburgh Castle in Edinburgh, the capital of Scotland. Over the years, the event has developed into one of the best and most influential military music performances in the world. This year's Royal Edinburgh Military Tattoo (7-29 August) celebrates 'East Meets West' and has brought together more than 1,000 performers from military bands, guards of honor and folk art groups from China, the UK, the US, India, Swiss, Canada, New Zealand and Australia in 25 performances. 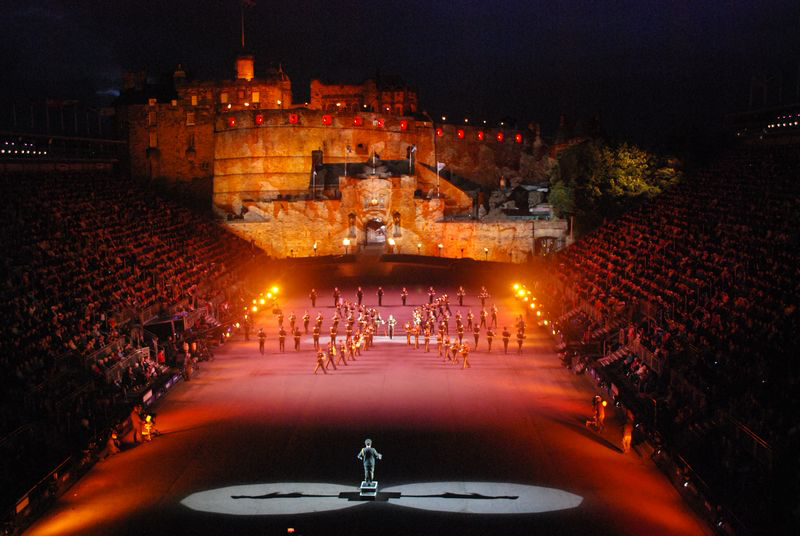 Performing in Royal Edinburgh Military Tattoo for the second time in eleven years, the Military Band of the Chinese People's Liberation Army is the only professional military band invited. Established in 1947, Edinburgh International Festival is one of the world's best-known art festivals that brings together top-class drama, dance, opera and classic music performances. This year's Edinburgh International Festival (7-31 August, 2015) attracts over 2,300 artists from 39 countries and regions.